"On behalf of the Palm Springs Mounted Police SAR Unit, I want to thank you for an outstanding day of instruction. We can immediately apply what we learned from you and will incorporate your techniques in our training and rescues." You asked for it you got it, here is our level two skills course. Take your skills to the next level over this weekend training intensive. No matter what your experience or background, you must have taken our weekend skills course or greater to attend this training. This course will include live scenarios that will challenge the student to "put the skill set together", think, and perform. Remember; in survival success is your only option, we train you to succeed. 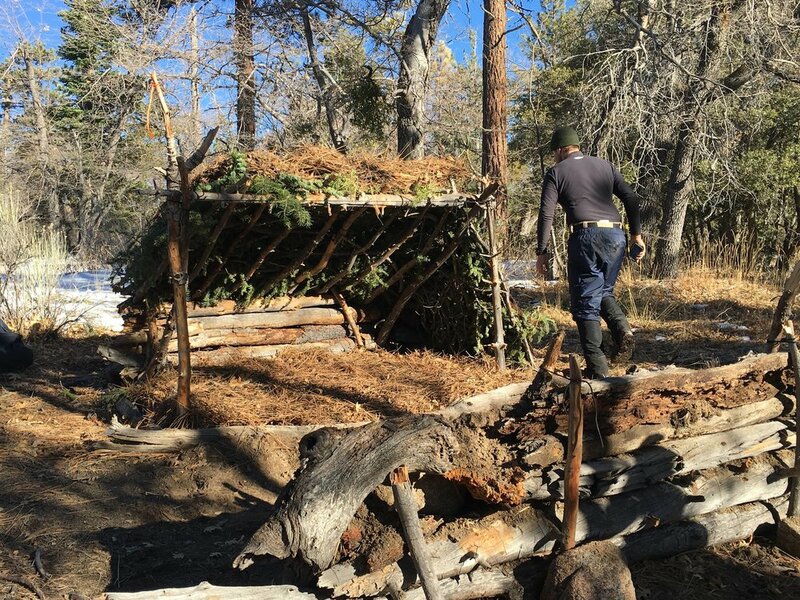 Our curriculum is based on life saving techniques to be employed in real life wilderness survival scenarios and is setting a new standard in our field. This course will be fully outdoors no matter what the weather, and is 100% hands on. Tents are allowed though students have the option to sleep in actual survival shelters they make themselves from the environment. *Elevated survival shelters and the "lean to"
Become a member for as little as $600 and receive unlimited training at a huge savingS. Click Here. High adventure camps located approx 6500' on the San Bernadino National Forest, tucked into tall Pine trees. Just outside Big Bear, Ca. You will have access to your vehicle in the evening so feel free to "overpack". Only 90 minutes from Los Angeles! *Feel free to bring any favorite survival gear you wish to train with! You will have access to your vehicle in the evening.